The mobility of wheeled or orbital mobile welding robot is constrained by obstacles, uneven terrain or orbit. 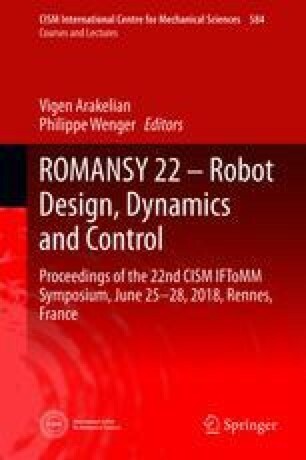 A new legged mobile welding robot which can surmount obstacles and move freely on uneven terrain is presented in this paper. This robot is the combination of a hexapod robot and a six DOF manipulator. Each leg of the hexapod robot is a three DOF parallel mechanism which has excellent load bearing capability. The manipulator is a PRPRRR mechanism which is characterized by motion decoupling. Inverse kinematic model of this robot is built, and workspace analysis is presented. Then, motion simulation of a typical welding workflow is delineated. This work is supported by Excellent State Key Laboratory Research Program (No. 51323005), National Natural Science Foundation of China (No. U1613208), and “Scientific and Technological Innovation Program” of Shanghai Municipal Science and Technology Commission (No. 16DZ1201001).